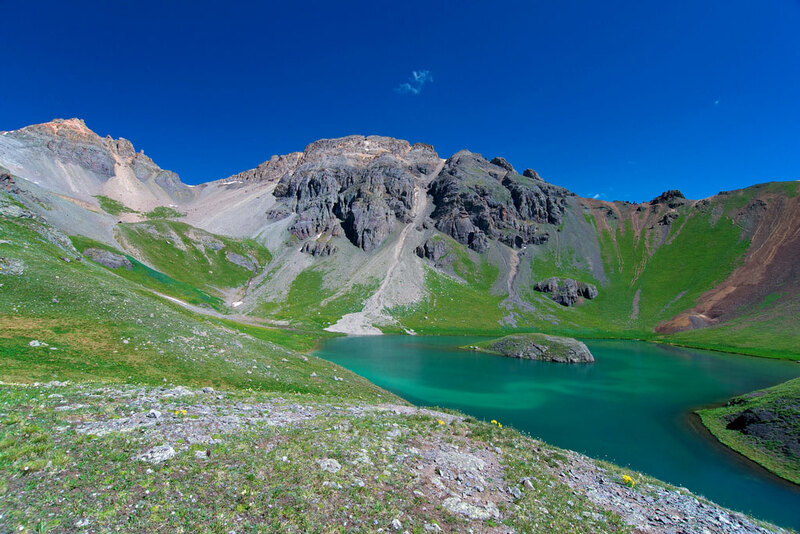 Though its name and luminous, aqua-blue hue might have you looking for a coral reef, this alpine lake can only be reached via a decidedly un-tropical hike near Silverton. At an elevation of roughly 12,400 feet, there's likely to be snow nearby year-round. Our San Juan National Forest hidden gem is Island Lake, which is one of four amazingly incandescent bodies of glacial water (Ice, Clear and Fuller lakes are the other three) that can be found in the Upper Ice Lake Basin near the town of Silverton. Island Lake surely got its name from the flat-topped rock that is visible whenever water levels ebb. On the four-mile trail to the lakes, hikers pass several legacies of the fortune-seekers who settled Silverton in the late 1800s — mines and equipment abandoned when the price of metal fell in the 1920s (though the last large mine in the area didn’t close until 1991). The entire basin is known as an alpine-wildflower wonderland during the summer months. Its position amid several jagged 13ers, including Vermillion, Golden Horn, Ulysses S. Grant Peak and Pilot Knob, ensures many a hardy climber pass through on their way up their chosen summit. At such high elevation, afternoon storms are common so dress in layers and be prepared to cross some small streams along the way. Hopefully those who didn’t strike it rich eventually figured out that the area’s real treasure was the beautiful lakes in this basin. To reach Island Lake, head west from Silverton on Hwy. 550 (also known as the Million Dollar Highway). Take the U.S. Forest Service Road 585 to South Mineral Campground. From there, a steep, four-mile hike with a 3,000-foot elevation gain leads you into the basin. Read 99 Gorgeous Places in Colorado: Part 1, The Postcard Places; Part 2, Local Favorites and Part 3: Hidden Gems. Photo: Courtesy of Nathan Wade.